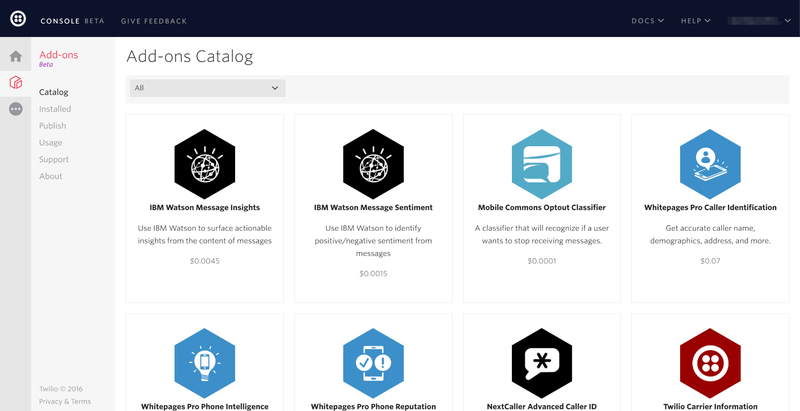 Inside the new Add-on catalog you can see all of the available API Add-ons. Let's go ahead and click Install Now. Now by clicking on Add-ons > Installed we can see which Add-ons we've enabled. Be sure to check the box next to "Incoming SMS Message". 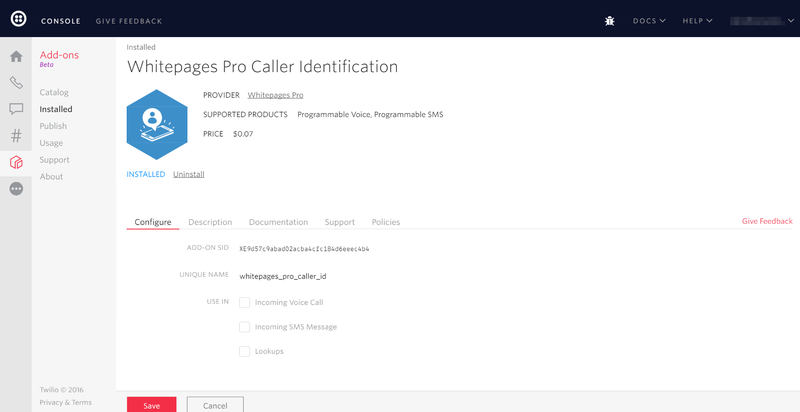 This url generates some TwiML that responds with a Message which includes White Pages Pro information about the From phone number sent with the Twilio Request. This information is identified by the Add-on Unique Name which is visible from the Add-on detail page in your console. Another nifty Add-on comes to us from Payfone, who protects your business from hefty fines for texting the wrong number under TCPA (Telephone Consumer Protection Act) regulations. The Payfone Add-on can quickly tell you if the number you are about to send an SMS to is active and still owned by your customer, with 100% reliability. 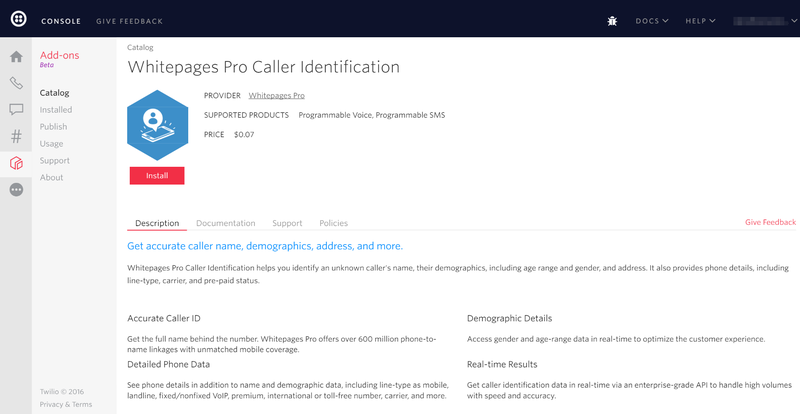 To use this Add-on we'll need to install it just like we did with Whitepages Pro. This time in your Add-on catalog we want to install: Lookups > Payfone TCPA Compliance. 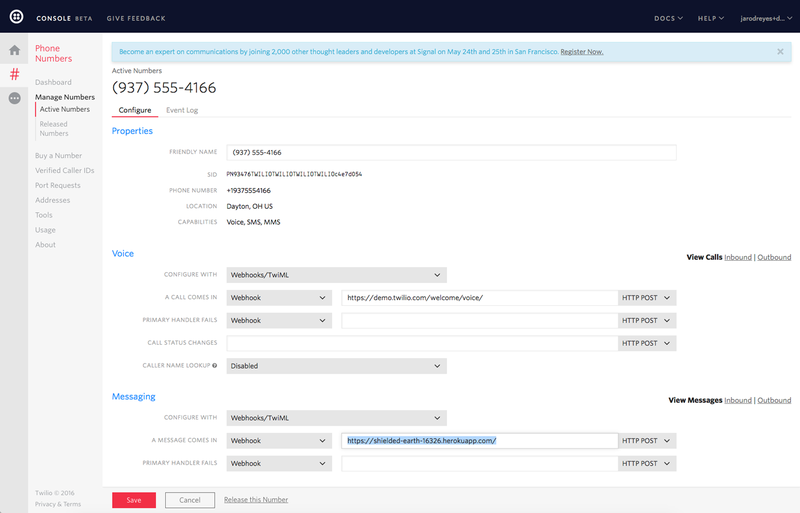 Now that we've installed the Payfone Add-on we can make a request using the Twilio Lookups API and ask for the TCPA Compliance information with the rest of the phone number details.